Creative Authority: It has been way too long!!! It has been way too long since I posted...sorry! We were in the Dominican for a family trip with all of Dustan's side. We had a ton of fun and it was great to be with everyone since we don't see them all that often. The food was not great, but the sun was shining, the ocean was amazing and the pool was cool! And the tiki tiki's (not sure if you spell it this way)...were super tasty...need to figure out what actually goes in these drinks so that I can make them at home! Here are a few pictures of our vacation! When I got home, I got some great and fabulous news...my good friend Jan has tested negative for any further cancer!!! Yeah Jan! I am super, super happy for you and can't wait to see you and have a good visit! Speaking of visits...I heard that you had a surprise! Hope you enjoyed having the visit with your daughter!! April is coming soon and our new monthly kits will be out soon at the Urban Scrapbook. The kits are made up of all Prima product...it is awesome! There paper is so versitile...you can do anything with it! Here is my take on April's kit...and be sure to check out Urban Scrapbook's blog...Pat, Sheri and Heather do a great job...there is tons of insipration on it! I made some flowers out of mutiple stacked scalloped circles and then glimmer misted with a teal color. This make the flower wet and allows you to manipulate it to create texture and dimension. I added beads to the edges of my butterflies and then crackle accents to the middle. The cracks show up really well when I went over the cracks with my chalk ink. The red rub ons that I used were Heidi Grace...super old ones...and the black letters are Pink Paisley! I love these letters so much that I went out and bought more after I used them on this LO! 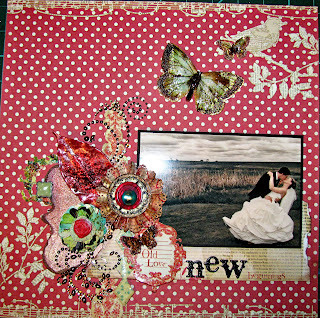 Can't wait to see what the other designers for Urban Scrapbook have done with their kits!